There is a Chinese proverb: a picture is worth ten thousand words; that could not be any truer of the picture that Linda Fagan hands me of her mother, Theresa Walsh. She stands about average height, with shiny blonde hair neatly tucked in a French bun, while the long fuchsia dress hugs her petite waist. She seems to be speaking to someone before the camera person takes the shot at the precise moment of when she smiles. 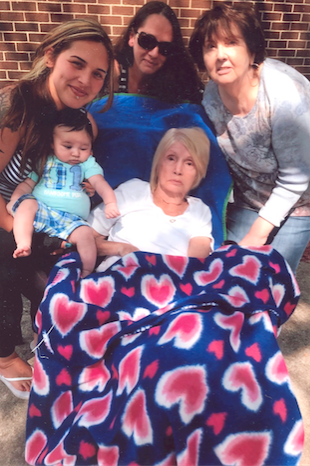 Linda hands me another picture of her mother; this time Theresa sits in a wheelchair with Linda, Theresa’s granddaughter, great granddaughter and great great grandson surrounding her. Her beauty proves to be timeless but as her face tilts to the left and her eyes scans out into the distance, it is obvious that the regal woman wearing the French bun is gone. Nevertheless, what is not gone is the legacy she leaves with her loved ones. She is remembered as a sweet, bubbly personality who enjoyed life, the Arts and was devoted to family. Born in 1931, Theresa married a man named Steven Garrison who worked as an insulator of houses. The couple were both Catholics who shared an Irish heritage, and their love for classical movies. Linda recounts childhood memories of staying up late to watch the Academy Awards with her mother. “I got my love of movies from my mom. We watched the Academy Awards together. She’d whispered ‘don’t tell your father,’” says Linda as she sits on her living room couch. Theresa was also a music lover and an active concert goer. She would attend The Eagle and Huey Lewis concerts with the family. The Garrison family originated from a one bedroom apartment in Bronx, NY where Theresa welcomed her first child, Linda, at age 19. As the family grew, Linda recalls her brother, Steve Jr., having to sleep in a drawer. In need of a larger place for their expanding family, the couple moved to a four-bedroom apartment in the Bronx’s subsidized housing units on 163rd street. When the Garrison family left the Bronx for Congers in Rockland County, their family grew to nine children. They moved again to Spring Valley as the family continued to grow and where Linda met her future husband, Al Fagan. During her first pregnancy Linda received an unexpected news from her mother: Theresa was expecting her 16th child. “At my baby’s shower my mother had to say to me, ‘Linda, I can’t hide it anymore. I’m pregnant.’ She didn’t want to take away the glory of me having my first while she was having her 16th,” says Linda. Theresa gave birth to her 16th and last child at 39. Ultimately, after 16 children and 30 years of marriage, she and Garrison divorced in 1975. She was a full-time homemaker until she took on a job as a jeweler for JCPenny in 1985 and worked for the department store for about 11 years. Against the pressures of a full house, Linda admires that her mother was a dedicated homemaker who kept the house immaculate and impressively managed 16 children, even when she took on a job outside of the home. Theresa retired after remarrying Michael Walsh around 2007 and subsequently, relocated to Tucson, Arizona. Garrison passed away from lung cancer on July, 2010. “I remember when he was in the hospital, she came. She wouldn’t see him but she came for him…like with her kids. She was that kind of person. She didn’t not come. She was there for her kids… for everybody,” Theresa’s great granddaughter, Allie Seeley, describes as she sits on a chair beside Linda, soothing her five-month-old son, Jackson Donovan. Theresa was diagnosed with dementia six years ago; one year after her diagnosis, she no longer recognized any of her family members. Her children were initially shocked by the news but banded together to support and care for their mother. They moved the matriarch back to a central location in NY, so they could all visit her at a nursing home. Michael eventually moved back from Arizona as well and visits Theresa every day despite the fact that she no longer knows who he is and cannot speak. Today, 11 of Theresa’s 16 children remain, and the majority of the family live in the Hudson Valley region. In a family of carpenters, salesmen, real estate agents, and property managers, Gabrielle Hernandez is the sole artist who inherited her great grandmother’s love of the Arts and is pursuing it as a career. She is a painter and drawer and has presented her works at a Haverstraw Arts festival. Hernandez was also formerly president of the Honors Arts Society at North Rockland High School. Linda settled in Stony Point with her husband and has lived in her multi-family home for 31 years. Furthering her mother’s value on the importance of family, Eileen Fagan, Allie Seeley, Jackson Donovan, and Linda’s brother are among some of the family members who inhabit the home as well. The family continue to band together when faced with health problems as two brothers are currently battling cancer. It is the hard work of being there for a sick family member that Linda is most proud of her family as it is what bonds them together. As I thank Linda, Allie and Eileen for sharing their story, I notice an inscription on a distant wall containing the quote “all my love, all my life.” Linda tells me that it belonged to her late father, and it was her parents’ favorite quote; this encompasses the life of Theresa Walsh, a devoted matriarch, who gave to her family, all of her love, all of her life.